Years ago, after seeing some of the mini books Jon Morris was doing, I started hand making books for family members as gifts (I still owe one to my youngest niece and don't know when I'll find the time to make it for her). This book was for Julia's cousin's daughter Maddy. With a smile on her face she would call me 'monster' when I came to gatherings with the sole expectation that I'd chase her. This month's Ink & Stein (Saturday the 27th) is at a new location! Based on the huge success of the gatherings (we have been getting 15-20+ people per month) we felt the need to move the event. The Corner Brewery, our former home, seemed like the ideal location. But they refused to accommodate us. They wouldn't reserve us space without a charge, they treated us like we were in the way, and ultimately were rude to our group. "Sorry we brought a group in monthly willing to buy food and drink Corner Brewery, we will annoy someone else with our spending." 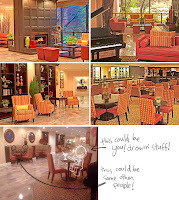 After Katie Cook scoured the Ann Arbor/Ypsilanti area for a new location she found the MARRIOTT at Eagle Crest! The space is full of tables and chairs that are spread out in a well lit area. This may make it easier for Ink & Stein-ers to socialize and not be locked into one seat as they were at the Brewery. The only drawback is the Bar closes at 11pm. However, it looks like we can hang out after that, but just not order any more. Jason Bradley sent this to me. His inspiration for the two panel strip was Steinbeck (obviously) and the Bugs Bunny Cartoons with Gossamer. Thanks Jason! Here is my cover for Muppet Snow White #1. I originally planned it for the cover of issue two, so it didn't make it into previews for solicitation, however, I have been given the go-ahead from Boom to share it. Snow is being played by Spamela Hamderson, while the 'dwarves' are the Electric Mayhem. Special thanks to Katie Cook who lent me some reference material to get this cover done. Narnia:I recently borrowed the Narnia audio books from Jeremy Bastian and I have been listening to them as I work. 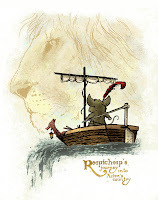 A few years ago, when I still had time for commissions, I did this piece of Reepicheep sailing off into Aslan's country. Bill Willingham wrote in the introduction to the Mice Templar collection that The Mice Templar, the Mouse Guard, and Willingham's own Mouse Police, are "sons of Reepicheep". I must admit, Reepicheep was in my mind when I drew the first mice, his bravery out matching his size. *edit* I just realized after getting to this point in the audio book, that I drew this without re-reading the scene and got the setting and a few details wrong. Fan Art:This week's Fan Art is from Charlotte Cheng. Thanks Charlotte! 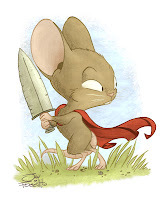 If you want your Mouse Guard Fan Art to appear on the blog, just e-mail a jpg to ericebon (at) hotmail (dot) com. 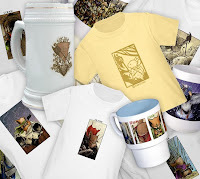 I have just revamped the Mouse Guard CafePress site! There are now all new shirt designs for men, women, & children. I also added new mugs. All of the old items (with the exception of a few mugs) are now unavailable. I plan on adding items from time to time, and I ask you guys to help me. If you see something that I don't have, but you need: suggest it to me. CafePress has some limited options with the shirts and colors, but I'll do my best if enough people ask for something. Many folks know that I have a children's book coming out in 2012. It was based on a hand-made gift I did for Julia on our first Valentine's day as husband and wife (which I intend to share next year) . For various reasons there had to be some changes from the original characters of Mouse (me) and Cardinal (Julia). In one of the tests I did for Harper Collins, I tried using a Cardinal for both characters. I also thought it would be fun to go back to traditional painting (the book now has bunnies as the duo and it's illustrated more like Mouse Guard). Here are those samples. The awesome Jay Fosgitt drew this for me last week. Jay is an amazing cartoonist, and it was cool to see how quickly he can draw and ink something (I suppose his work as a caricature artist doesn't hurt his speed). I brought the original of this home and colored it. Though I don't get to do it much these days because of the inked style of Mouse Guard, I also like to do rendered drawings in pencil. Frequently I would also color or tint these drawings in photoshop. 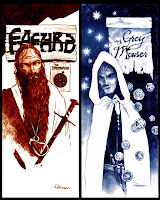 In this example of Fafhrd & the Grey Mouser, I merely tinted the linework on my greyscale drawing using the color balance tool. I also adjusted the levels (the control over what pixes are black, white, and middle tone) and cleaned up or enhanced the highlights. On this Hellboy piece I also tinted the linework. Because this was drawn on toned paper, the paper also took the tint instead or remaining white like above. Because I started this drawing as a simple sketch, the area on the left was just scribbled in and not completed by hand. I finished that area using the burn tool. The additional highlights were added using the dodge tool. These two examples are excellent ways of quickly touching up a pencil drawing and adding some quick color. I find that sketches can get polished up to 'finished-drawing' status quickly using this method. 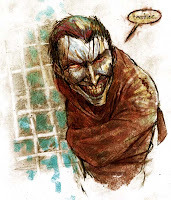 The Joker piece on the left is an example of a more painterly approach to coloring pencil drawings. Once scanned, The pencil artwork was on a top layer set to multiply and then tinted. On layers below, I used various photoshop brushes to digitally paint the tones. I was aiming for a gritty and chaotic look for the Crown Prince of Crime in Gotham, so I didn't worry that the colors didn't strictly adhere to the lines. This last example (of Red Cap) is a mix of the styles above with an added twist. Besides tinting the artwork and adding painted colors beneath, I also scanned a swatch of painted watercolor paper. With my pencil art and color layers set to 'multiply' the scanned watercolored background is also visible. I find that playing with pencil drawings in photoshop helps me figure out ways I can make my work better in the future. It's a quick way of seeing if my rendered areas need more or less contrast, if color helps or hurts the lines, or to play with color in ways I wouldn't normally. This week's piece is a digital painting from Kyle Galbraith. You can check out more of his work at his DeviantArt site here. Thanks Kyle! 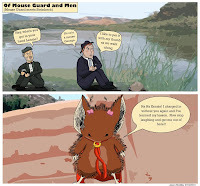 If you want your Mouse Guard fan art displayed on the blog (sculpture, painting, drawing, etc.) send an e-mail to ericebon (at) hotmail (dot) com.